Confidex announced its 6C RFID Windshield Label has been certified by OmniAir Certification Services, Inc. (OCS), a technology-focused member association created to enable the deployment of interoperable advanced transportation technologies and applications. 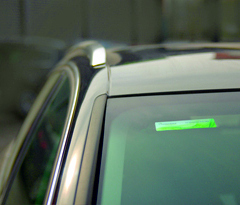 The Confidex windshield label is designed for fast and reliable automatic vehicle identification applications such as electronic toll collection. With the OCS recognition, this will position Confidex as a certified, high-quality, high-volume RFID tag provider for the North American electronic toll collection market. Incorporating the Impinj Monza 4E chip, the windshield label is based on passive ultra-high frequency (UHF) RFID 6C technology (ISO/IEC 18000-6C RFID protocol), a leading candidate for providing interoperability across North America for toll collection applications. The Confidex label is attached inside the vehicle windscreen and can be read automatically from several meters away, even at high speeds. It can be easily and extensively customized with surface printing, security markings or special programming.